Happy Friday!! The first week of April is officially under your belt. That is crazy talk, but that just means that hopefully it's one more week closer to me feeling the heat of spring on my skin for real! This weather has been such a tease! 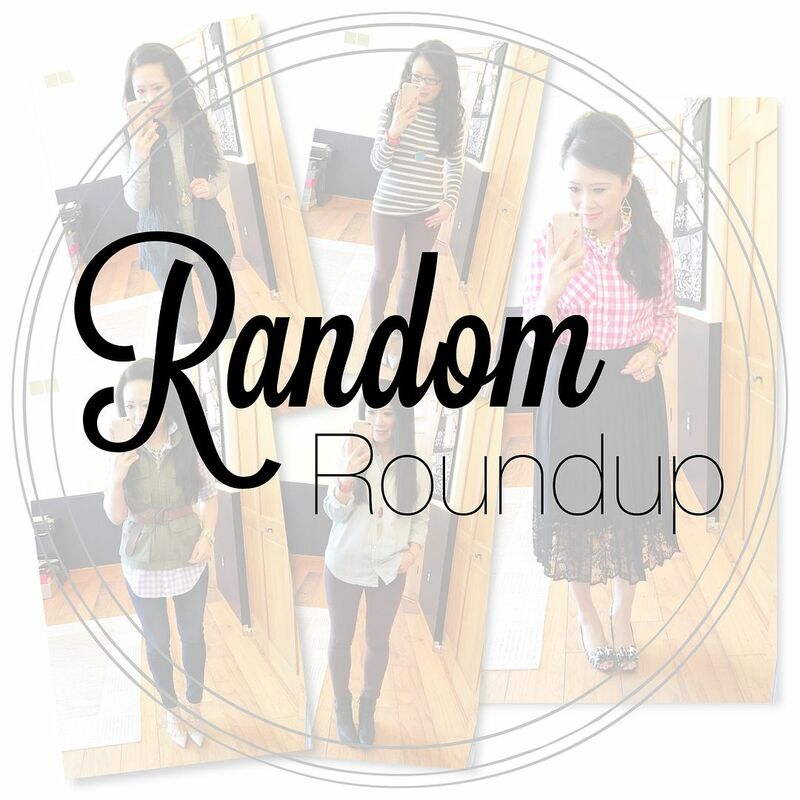 I want to dress for spring so bad, but long sleeves and layers are still a necessity as you will see in today's random roundup of selfies! Let's get started! This outfit is basically a replication of this one here. I don't know why it's harder for me to style this lavender gingham top compared to my navy and my pink one, but I realized it is pretty interchangeable with the other two and I can style it the same ways! I had to travel to Dallas this week for an overnight trip, and this was my airport outfit for the first day. 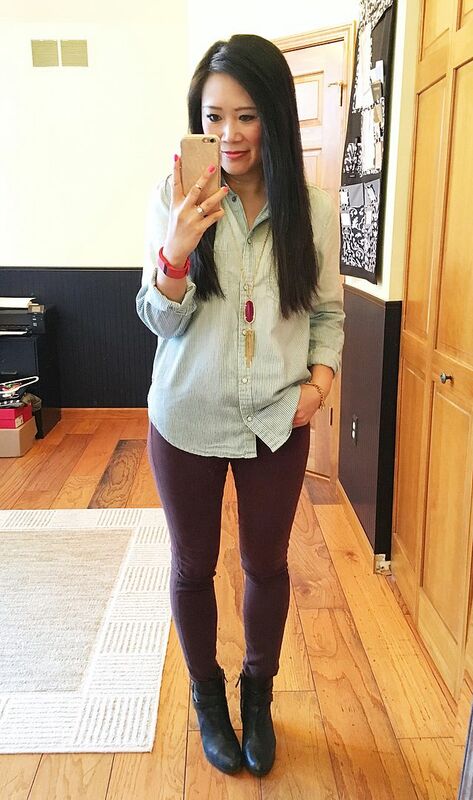 I originally planned to wear my olive skinnies (seen here) but I didn't like the way they bunched at my ankles when I tucked them into my booties. So, I grabbed these instead and it was the perfect travel outfit. I was quite impressed with these booties - I walked a ton of steps in them, and was on my feet for a good 6 hours straight (standing for 6 hours which is even worse than walking for 6 hours), and my feet survived unscathed! It makes me NEED more Cole Haan shoes. I picked these for the trip because I needed closed toe shoes but wanted a stacked heel and they worked pretty perfectly. More than perfect! Speaking of more than perfect - I am officially obsessed with these cognac peep toes! It took me a good year or more to find the perfect pair. They're such a simple shape, you wouldn't think it would have taken as long as it did! These were definitely worth the wait and I love the way they popped against an all grey outfit! 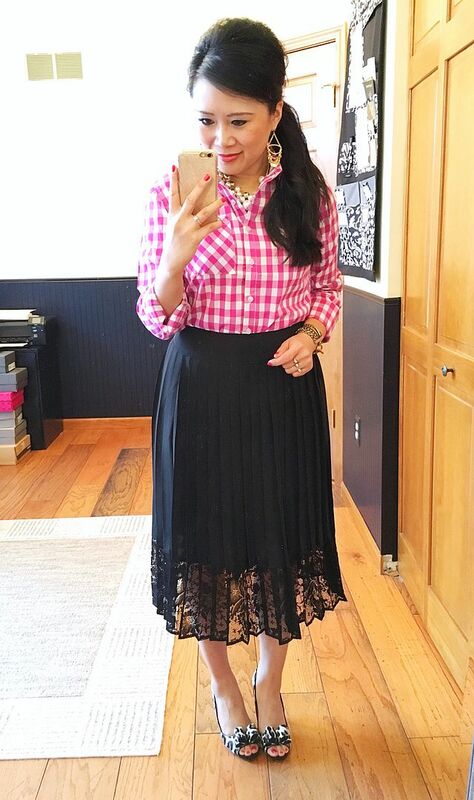 Two gingham shirts in one roundup, are you impressed? 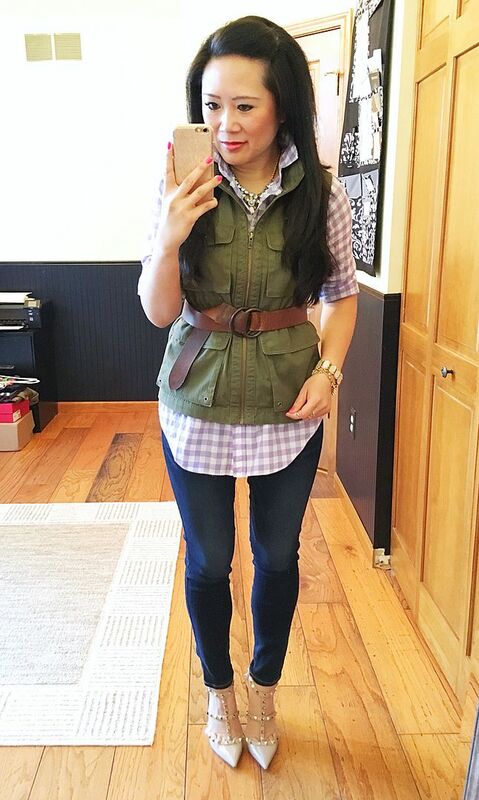 Coincidentally, this is also a remake of another outfit styled with my navy gingham top. The outfit formula was basically: gingham top, full black skirt, animal print heels. 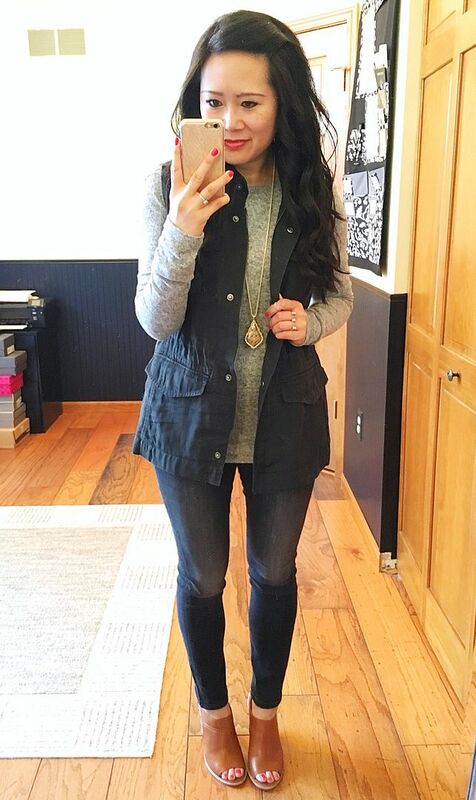 You can see the inspiration for this outfit in this remix post here. I told you all ginghams are basically interchangeable with each other! These are the same Joe's jeans that are in the second outfit up above in this post. I love them so much. I wish I had them in a million colors. They are so super soft and they fit perfectly and I love how seamless they look even with a more fitted top. I also love this top and wish I had *it* in a million colors. I just ordered the black and white version. 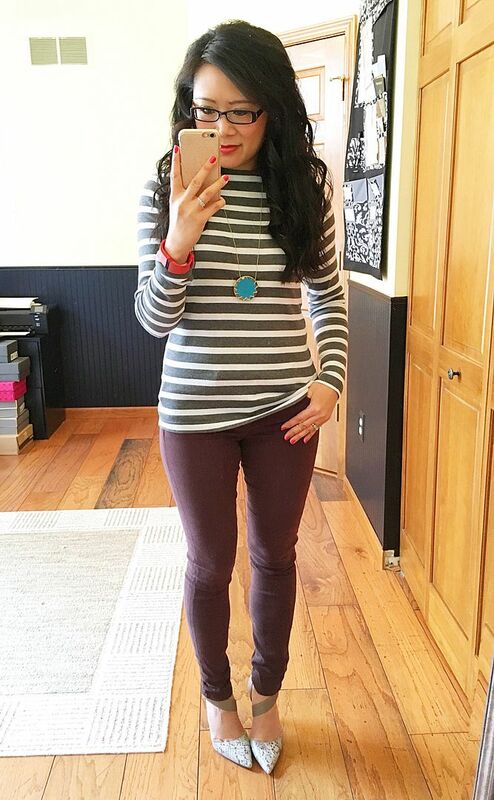 I realize I have a lot of black and white striped tops already, but I just love the neckline and the length of this one. I feel long and lean in it. I would have ordered the navy also if they had my size! Plus it was $12.99 so how can I say no to that?? Hope you all have a great weekend!! No real plans this weekend, so I'm hoping to catch up on life. I do need to find a dress to wear for a wedding we're going to next weekend. 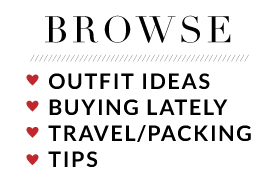 I also have a hair appointment and a local blogger assignment to do! Nothing super labor intensive, so I'm very much looking forward to relaxing!! Have a good one! love all of these and yes the purple gingham is challenging for me too. Speaking of Cole Haan they are having a friends and family sale as well. Love your spring gingham! Have a great weekend. 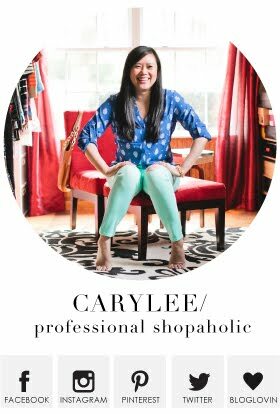 Your first outfit takes the cake, Cary. The belt. You had me at the belt. Belts and I, we don't get along, so whenever I see someone pulling it off with panache, as you did, I'm an instant fan. Especially as most people would've stopped with the vest, not zipped it up and wrapped a belt around it :) you look spectacular in that.